Have you ever discovered your horse is stiff, sore, or even injured and not known how you can help? Even if you already have therapy tools, choosing a therapy device that works is often confusing. Luckily, there are a wide variety of therapy tools that are safe, affordable, and easy-to-use enabling you to help your horse from the comfort of your barn. In Part 1 and 2, I touched on the importance of microcurrent and how to use tools such as thermal imaging cameras and the Best-Vet device to locate problems. Every therapy has its own specialties and no device can fix every problem, so it is beneficial to have a few options in your toolbox. Qi Gong massagers, light therapy, and iontophoresis are three user-friendly therapies that are great complements to microcurrent. The Qi Gong massager’s soothing sound waves provide fast pain relief ideal for joint pain and muscle-related issues. Keeping muscles supple and relieving soreness are two of the favorite uses for Qi Gong massagers. The Qi Gong is also particularly remarkable at treating chronic muscle soreness, hard swellings, hematomas, scar tissue, and shoe boils. Qi Gong massagers deliver low-level frequencies to your horse, which are extremely safe and do not heat your horse’s tissue. The handheld piece, which is connected to the unit, can be held in close proximity to the area needing treatment or in direct contact with your horse. The Qi Gong uses infrasound (sound waves) therapy and low frequencies that heal your horse by traveling deep into the tissue and throughout its body. It is never fun discovering your horse has a wound, especially if it will take a while for the veterinarian to arrive. 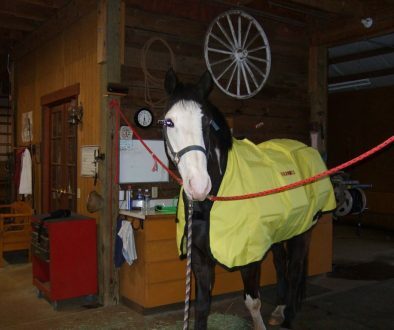 Light therapy is an easy and effective tool you can use to immediately help your horse. The soothing red and infrared light provides pain relief, stimulates healing, and prevents the formation of scar tissue. Most light therapy products are easy-to-use, cordless, handheld units, making them a great tool for your first therapy device. Light therapy is great for issues such as sore muscles, laminitis, and scar tissue, as well as stimulating acupoints along the Chinese Meridians. Also, light therapy is an ideal tool if your horse is extremely sensitive, because it does not have to come in direct contact with the skin during treatments. There are many light devices on the market, and a high-quality unit with added frequencies usually produces better results than devices with only light. Qi Gong infrasound massagers can provide pain relief for saddle soreness. Microcurrent Recap: It is a highly beneficial therapy using low-level electrical stimulation. 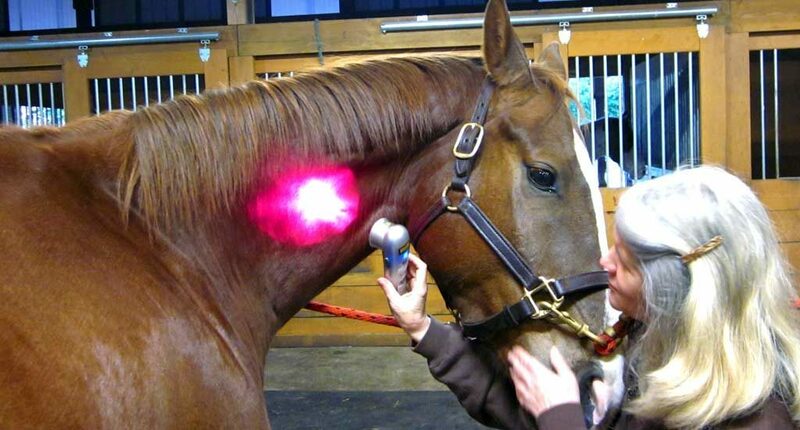 Horses enjoy light therapy’s soothing treatments. Speed Healing: Light therapy typically reduces healing time by 50% on wounds. Iontophoresis with a phoresor unit, which can treat two sites at one time and uses low milliamperes to high microamperes. Iontophoresis is a fancy term for using a small amount of low-level electrical current (microcurrent) to transfer medications through the skin. If your horse has a ligament injury, joint pains, or a condition involving calcification, iontophoresis is a safe tool to increase your horse’s comfort and help resolve the problem. The combination of current and medication has proven highly effective as an alternative to joint injections, especially for maintaining hocks and ankles. Iontophoresis is a non-invasive process so it is safe for you to do in your own barn. However, only certain medications can be used, so it cannot replace all types of injections. For horses with conditions such as ringbone, iontophoresis has been found to arrest calcification, reduce external appearance, and increase the horse’s comfort. Some horses that were completely lame from ringbone have actually returned to full soundness through the regular use of iontophoresis. Iontophoresis is also an excellent method to support slow-healing ligament and tendon injuries. If you’re familiar with using microcurrent therapy, then it is an easy transition to treating your horse with iontophoresis because the procedure is quite similar. The basic process involves adding veterinarian-provided medication to special pads, then applying the pads to the horse where it needs treatment. The source of current can come from self-powered patches or units designed for iontophoresis. Knowledge of microcurrent and these complementary therapies can fill out your toolbox so that you are prepared for any problem you might encounter. To read the first installment of this three-part series published in SouthWest Horse Trader, Click Here and for the second article, Click Here. Veterinary Iontophoresis Drug Chart	What is the IontoPatch?